3.14159265. Nine digits of pi is all I can remember. My older daughter left me in the dust back when she was in fourth grade and inspired to memorize as many digits as possible for a class contest. Which isn’t to say that my children thought of pi as a list of random digits. I’m a scientist, and I wanted them to understand what pi was because it’s something I’ve actually used at work. We’ve taken string and cut pieces the length of the diameter of our (round) kitchen table. I wanted them to see how many pieces were needed to go around the table edge—just a bit more than three. We’ve tried the same thing with a cake pan. Same result. With a round Tupperware—ditto. With anything circular at hand, the answer was always a bit more than three. Circumference divided by diameter—that is pi. Why this fascination with pi? And why are so many people talking about today—March 14, 2015—as the Pi Day of the century, and maybe even planning a celebration at 9:26 a.m. and 53 seconds? I can speak only for myself. And personally, pi obsession is not surprising when your last name (Pitesky) starts with Pi (even if it’s pronounced “pih”). I’m making the Momofuku crack pie, a peanut butter pie, lemon angel pie (really, a pavlova—also a pie family member), derby pie, and maybe a vegetarian smoked cheese tart. Pi is a number that’s been known for nearly 4,000 years and has been useful to humankind for many reasons, most famously because it allows us to measure things like the diameter of a tree trunk if you know its circumference. What makes pi special and compelling is the difficulty—in fact, impossibility!—of figuring out its exact value. Pi is what is known as an irrational number because its digits keep changing on to infinity and can’t be neatly represented as a fraction. Ancient Babylonians and Egyptians approximated pi’s value as three and one-eighth and the fraction 16/9, squared, respectively. Brilliant thinkers from Archimedes to Euler devised increasingly accurate methods for calculating pi. Nowadays, cutting-edge computer algorithms have calculated pi out to more than 13.3 trillion digits. People compete to memorize the greatest number of pi’s digits ; Apu of TV’s The Simpsons has memorized it to 40,000 digits. (“The last digit is one,” he says.) Pi is a living, breathing piece of mathematical history. At NASA’s Jet Propulsion Laboratory in Pasadena, California, where I work, we have a special affection for pi. I help plan the science observations that the Cassini spacecraft will perform as it orbits around Saturn. Saturn’s moons are also orbiting around the gas giant, and both Saturn and the Earth are orbiting around the sun. Consequently, figuring out when the spacecraft will be in a good position to capture images of the moon Enceladus, or when we can send data back to the Deep Space Network antennas on Earth, involves a lot of geometry for our navigators, mission planners, and scientists. There’s even a special maneuver Cassini’s navigators use known as a “pi transfer,” which involves two flybys of the Saturnian moon Titan at opposite sides of the moon’s orbit around Saturn. The flybys are separated by 180 degrees, and if you’re expressing that in a sometimes more convenient unit to measure angles—radians—you’d need a pi number (3.1415 …) of them. That’s why we call it a “pi transfer.” We also call Cassini’s high-value science activities “Pre-Integrated Events,” or “PIEs,” just because we love the sound of that word (and because we love acronyms). My work with space reinforces to me that pi isn’t just a bit of mathematical trivia. Pi is something that has real, concrete applications in our lives, whether it’s figuring out how fast a spacecraft is spinning (in order to sample Saturn’s dust and plasma environment in all directions, for example), or calculating how many inflated balloons I can fit in the back seat of my car. 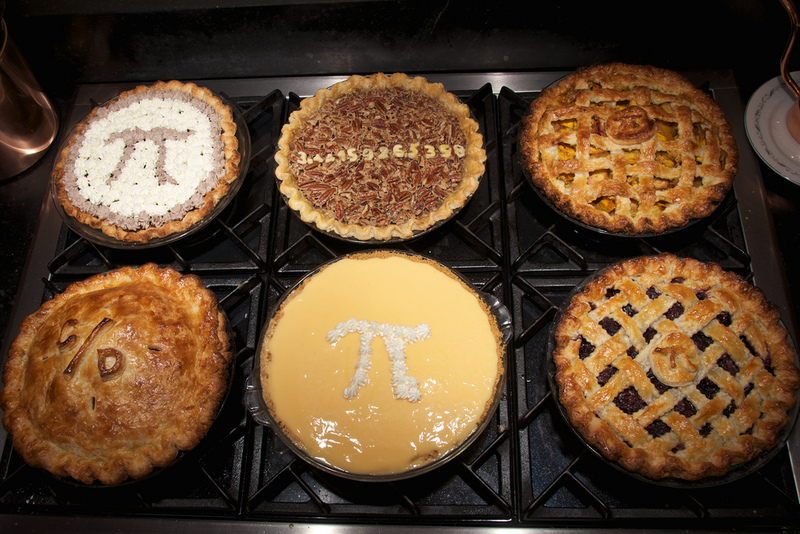 Reminding people about the centrality of this constant, and mathematics, to our everyday lives is the reason Larry Shaw, of San Francisco’s Exploratorium, organized the first Pi Day on March 14, 1988, and why even Congress has approved its commemoration. What makes this year—’15—special is that we can add two more digits to the date, which only happens once a century. It’s conceivable that there will be an exact moment on 3/14/15 when the time will exactly match the 30-trillion-plus digits of pi that are known now. But without clocks that can count milliseconds or microseconds, most of us humans have to be happy with stretching it out for only a few more digits. I can’t remember exactly when I started celebrating Pi Day. Maybe it was from an old-style Usenet forum, in the days before web browsers became ubiquitous. Maybe it was from work colleagues. I’ve seen Pi Day grow from something that was only mentioned among fellow math and science enthusiasts to an event that allows even math haters to get excited about numbers And as a baker and a nerd, I’m always happy to celebrate Pi Day with a pie. In this year of Ultimate Pi(e) Day, my husband and daughters—both home on college spring break—are ramping up for 9:26 p.m. and 53 seconds tonight. We’ve invited a couple dozen coworkers and friends to bring over one pie each to our home. Or a tart, or a galette, or a quiche. And yes, pizza is a member of the pie family. If you’re looking for recipes, I’m making the Momofuku crack pie, a peanut butter pie, lemon angel pie (really, a pavlova—also a pie family member), derby pie, and maybe a vegetarian smoked cheese tart. We’ll be showing a YouTube playlist on the TV featuring some great pie fights (if you’ve never seen Jack Lemmon, Natalie Wood, and Tony Curtis in The Great Race, watch this). It will also flash up pi humor—like “My PIN is the last four digits of pi”—which would be of absolutely no help in remembering your PIN because pi’s digits stretch on to infinity, so there are no last digits. By the end of the evening, I’m hoping everyone will be able to proudly wear this T-shirt. Jo Pitesky is a member of the flight team for NASA’s Cassini spacecraft, based at the Jet Propulsion Laboratory in Pasadena, California. *Photo courtesy of Dennis Wilkinson. math, mathematics, science, Thinking L.A.